Mmmmm…French fries. Nom nom nom. It takes a lot of will power to order a side salad instead of fries when eating out. If we are with a group of people, we like to order a side of fries for the table to share. That way, we still get the tasty treat we crave while getting our greens, too. 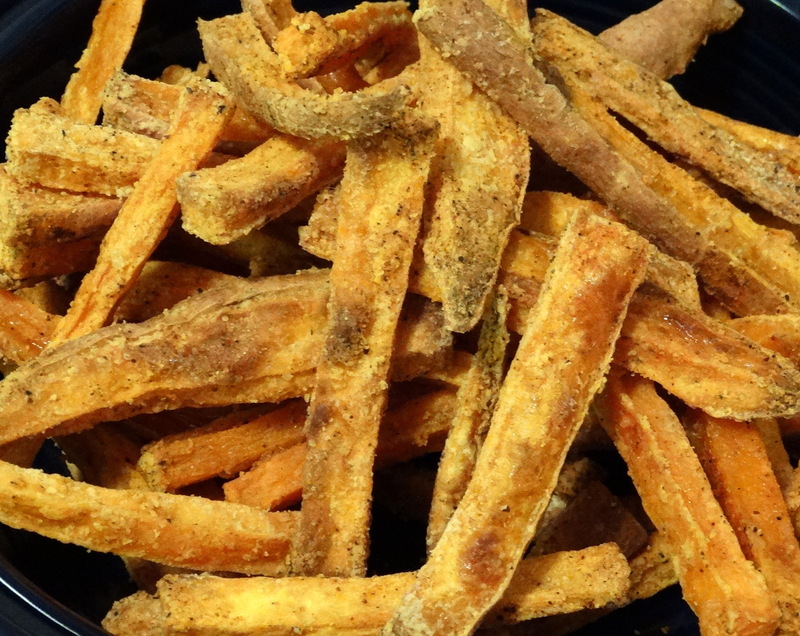 It’s a rare occasion that we eat fries at home, but when we do, we prefer to make our own. Store bought pre-packaged fries are often loaded with unnecessary chemicals. All you need to make delicious homemade fries are potatoes, some spices, oil, and a bit of corn starch to help them get crispy. 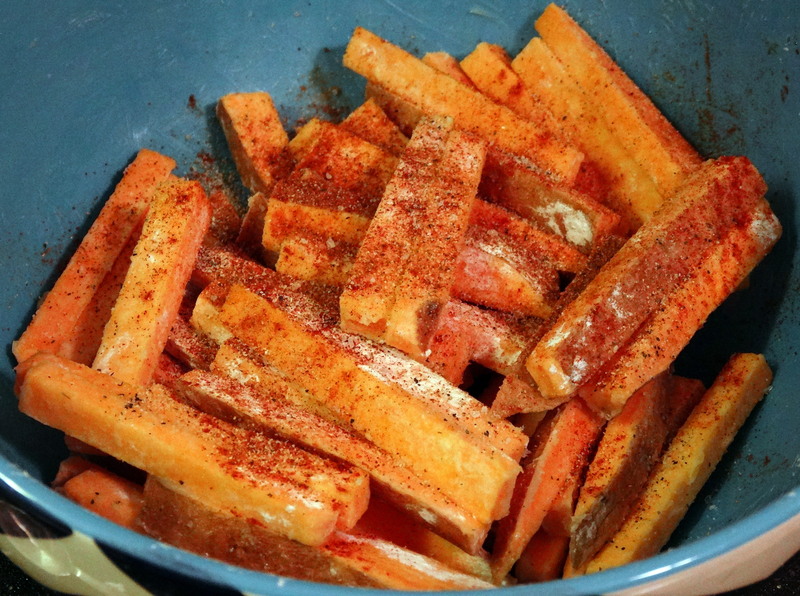 Wash and slice one medium sweet potato per person into matchsticks, about 1/4″ thick. Place the cut potato in a large mixing bowl. 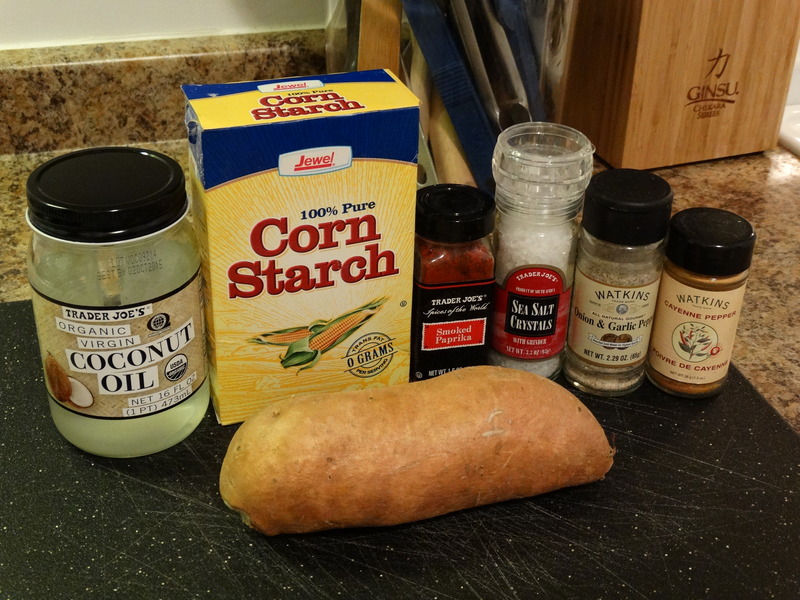 Add 2 teaspoons cornstarch per potato. Use your hands or tongs to toss the potatoes until they are evenly coated. Add 1 tablespoon melted coconut oil per potato to the bowl, then add your desired seasonings to taste. I wanted to spice mine up a bit, so I used a dash each of smoked paprika, coarse sea salt, cayenne pepper, and onion/garlic pepper. Gently toss again to mix. 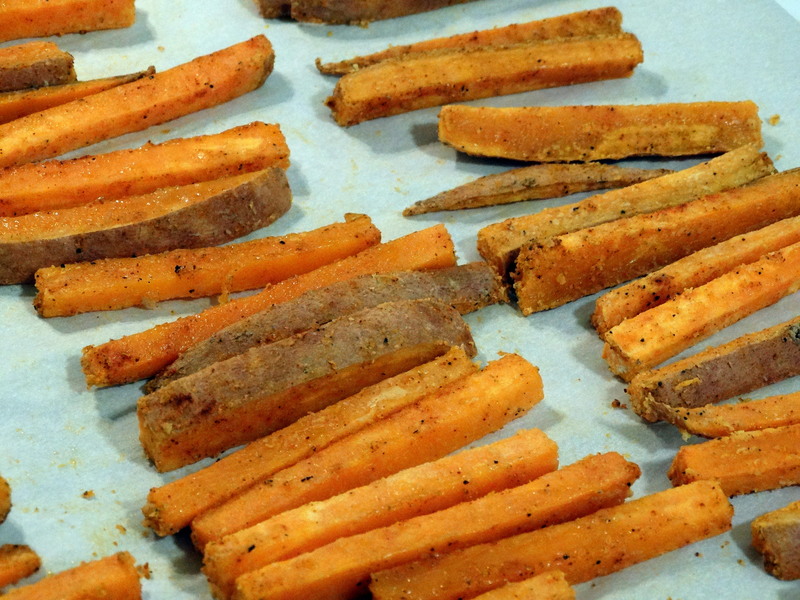 Line a baking sheet with parchment paper, then add a single layer of the sweet potatoes. Be sure to leave a little room between the slices so that they will bake and crisp nicely. Bake your fries for 15 minutes, remove from the oven, turn, and return them to the oven for 15 more minutes. To ensure even cooking, make sure to rotate the pan before returning it to the oven. Turn the oven off and leave your fries inside while it cools down to help them get nice and crispy. Check them after 15 minutes and pull them out when they are crisped to your liking. They are delicious on their own, or with a dipping sauce of your choice. Enjoy! *Feel free to use any seasoning you wish. Give ground cinnamon or curry a try! 1) Preheat your oven to 400 degrees. 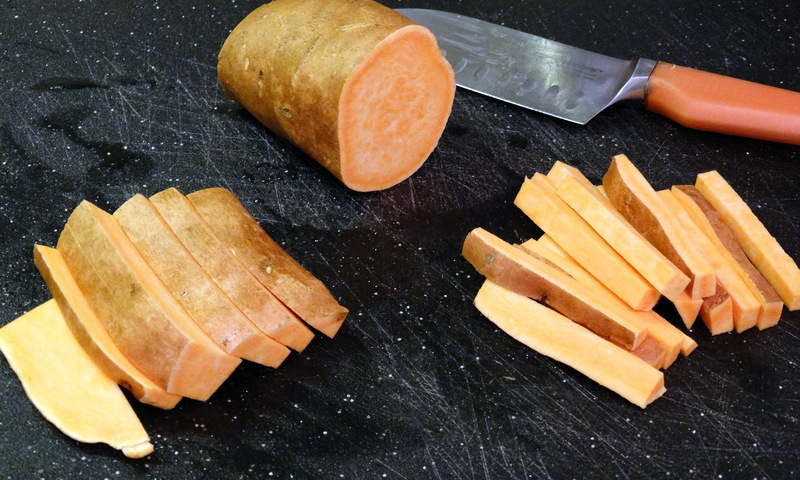 Wash and slice one medium sweet potato per person into matchsticks, about 1/4″ thick. Place the cut potato in a large mixing bowl. Add 2 teaspoons cornstarch per potato. Use your hands or tongs to toss the potatoes until they are evenly coated. Add 1 tablespoon melted coconut oil per potato to the bowl, then add your desired seasonings to taste. Gently toss again to mix. 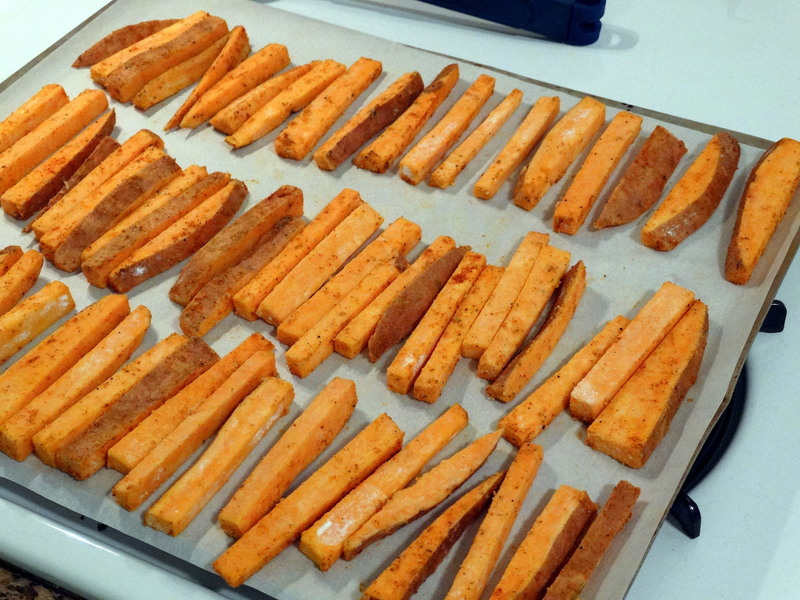 2) Line a baking sheet with parchment paper, then add a single layer of the sweet potatoes. Be sure to leave space between the slices so that they will bake and crisp nicely. Bake your fries for 15 minutes, remove from the oven, turn, and return them to the oven for 15 more minutes. To ensure even cooking, make sure to rotate the pan before returning it to the oven. 3) Turn off the oven and leave your fries inside while it cools down to help them get nice and crispy. Check them after 15 minutes and pull them out when they are crisped to your liking. Spicy is my middle name! LOVE paprika. These look amazing. I love how spicy seasonings play with the sweetness of the sweet potato. Thanks for sharing at ‘Tell em Tuesday’!